It's been a busy few weeks over here at Burp! And, for the most part, it hasn't been the usual sort of busy. Peef underwent surgery on October 9th to remove a benign tumor in his parotid/salivary gland. Although it was a delicate procedure (lots of facial nerves impacted) and long (5 hours!) surgery, I'm more than happy to report that things went well, and he's on his way to a full recovery. He felt well enough last week after his stitches were removed that we were able to tag along on a series of tours with the Wisconsin Milk Marketing Board. We chatted with cheese makers from Widmer's Cheese Cellars and Crave Brothers Cheese. And we took lots of photos! We'll share some on the blog in the next few days. Needless to say, we haven't been particularly inclined to go all out with our cooking lately. Fortunately, when life gets a little crazy, we have a nice selection of one dish meals that never fail to save the day. They're generally quick and easy -- and if we're slick, we can squeeze our protein and vegetables in all at the same time. Traditionally made from a coarse mixture of meat, potatoes and onions, hash is staple comfort food at its best. 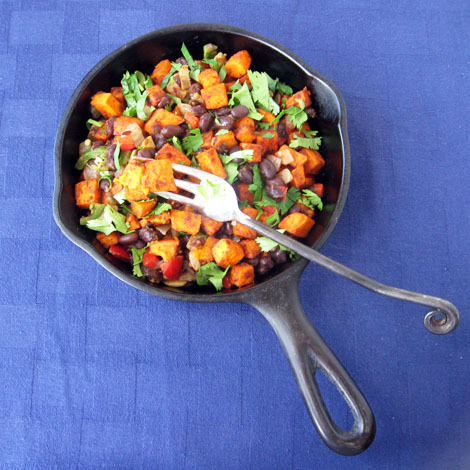 This vegetarian version makes the most of autumn flavors – butter-roasted sweet potatoes, black beans, onions and red peppers pulled together with a cacophony of Southwestern spices. It's chock full of protein, fiber, and plenty of vitamins from the sweet potatoes and red peppers. And it's pretty versatile. 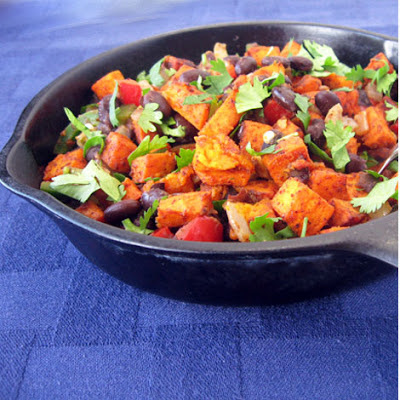 Top this hash with sour cream and salsa for a delicious vegetarian dinner. Serve it for breakfast with poached or fried eggs, or enjoy it as a light lunch with a side salad. Leftovers make a great filling for burritos or enchiladas. Wait, what?? How did I miss that on Facebook? So glad to know he's ok. And can still eat cheese. And hash. Hugs to you guys! @Amy - Oh, Lord. Thank GOODNESS he can still eat cheese! :) He is doing well, and eating hash like a champ! Thanks so much for the hugs! Right back at you. Best wishes and speedy recovery to P! Thanks for the inspiration...burritos it is! Cheers! This looks fabulous! Glad to read your on the road to recovery. Glad to hear he's recovering well! And this dish looks fabulous!